Check out the latest classes we are offering this spring here at Fernwood Nursery. Perhaps you would enjoy an afternoon identifying woodland natives or a class that will give you the basics for raising your own bees. Go to our ” Classes and More ” to find out what is happening this spring. In the meantime, here at the nursery, we are busy planning and preparing for opening this season. Seeds are being sown and the greenhouse is getting its yearly “spring cleaning”, pots are being washed and sorted with anticipation of being filled . We all know that our gardening days are right around the corner. See you soon! 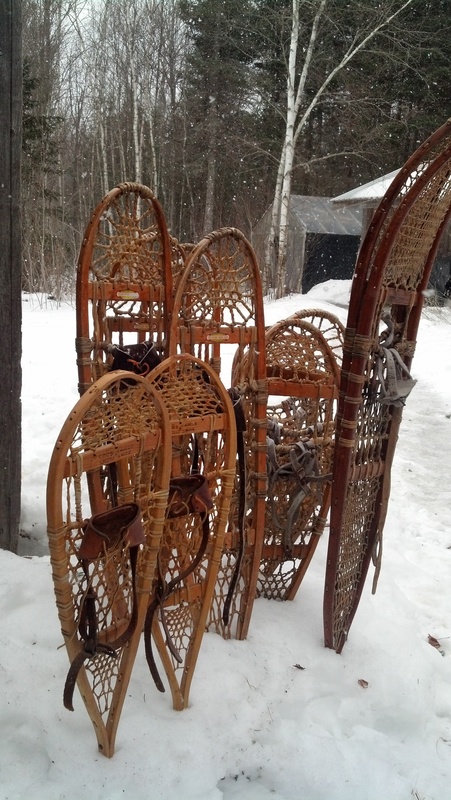 This weekend at Fernwood we spent much of our time wandering the woods and trails on snowshoes. 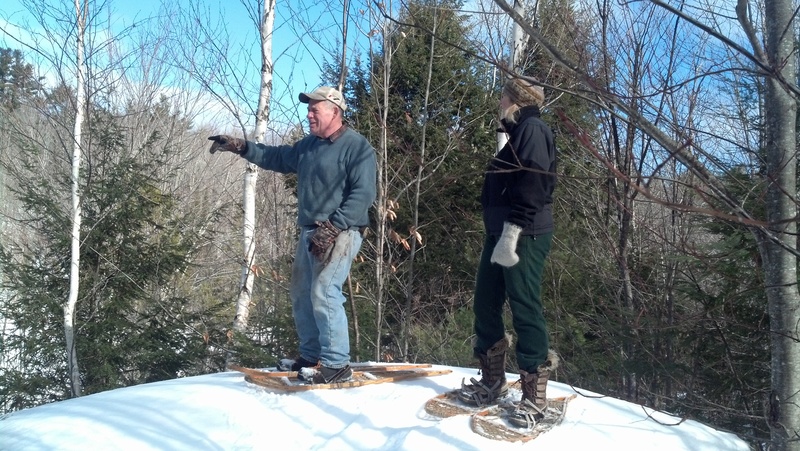 Our dear friends, Rick and Kari came from Virginia to visit and enjoy some winter weather. Kingdom Bog was especially beautiful. 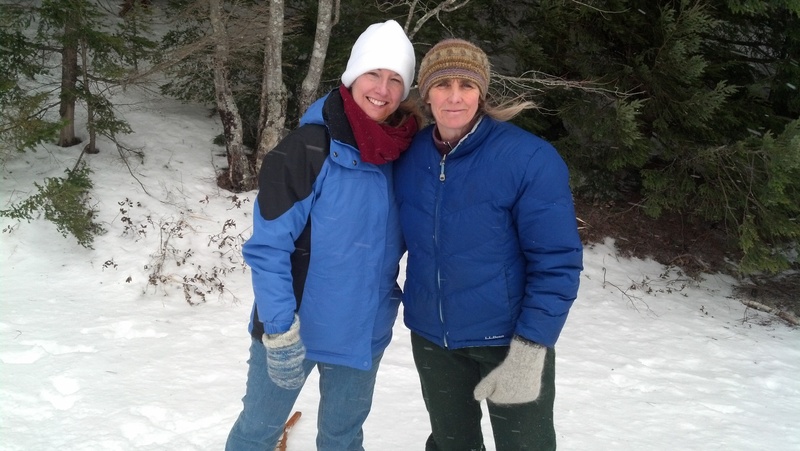 Here are some photos of our winter treks. 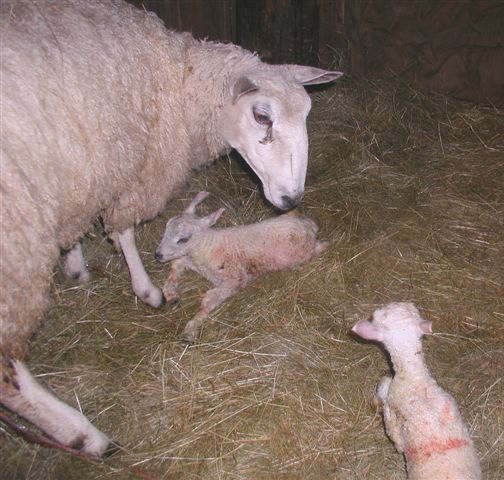 Our first lambs of the season were born this morning. 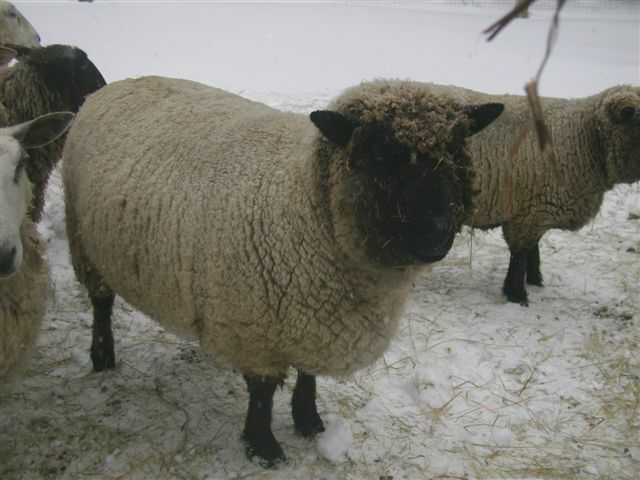 Our ewe, “Pippin,” timed her delivery just as we arrived at the barn to do morning chores. Much better than the middle of the night! Pip is an old pro and delivered a set of twins without needing any assistance. 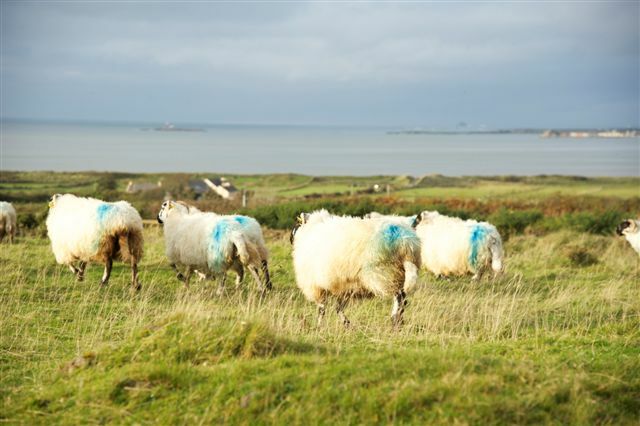 We have rarely had to help deliver during lambing season; sheep tend to be pretty easy going and efficient at birthing. The stress for me comes after the birth…waiting for the lambs to get their wobbly legs beneath them and to start nursing. Again, it is not very often but occasionally a lamb may have trouble nursing or a ewe refuses to respond to her motherly instincts and we end up bottle feeding the lamb. 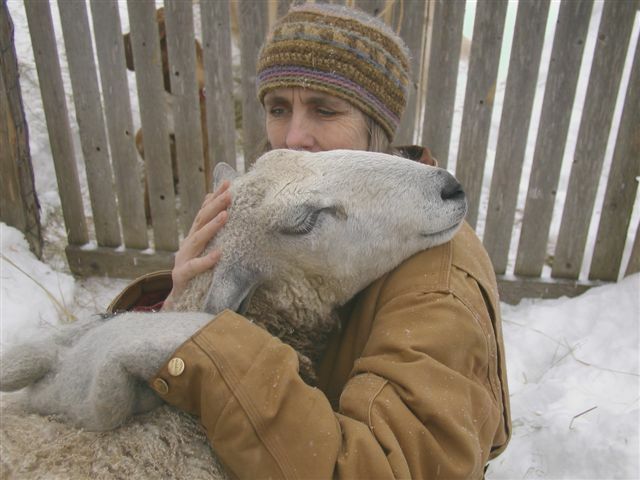 This has only happened with my flock perhaps twice in all the years of raising sheep. I have been lucky with good mothers. Despite the blustery weather and snow showers, all is well with our new arrivals. They are up and around and (thankfully) enjoying the benefits of their mother’s milk…and not surprising, they don’t look a thing like Wallace. This is Wallace. 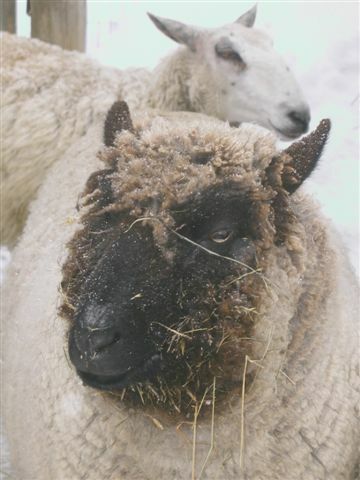 He is a Southdown wether that has come to live with our flock for the winter. He and his two sisters, Penelope and Fiona, belong to our friend Sally. Since Sally spends her winters in Florida, Wallace and his girls needed a place to hang out, so they were invited to stay here. As I said, Wallace is a wether, which means he has been castrated and cannot breed. He has lived his whole life with his sisters and never seemed too interested in anything aside from eating his hay and grain, roaming about his grassy pastures, and getting lots of back scratches. I’ve known Wallace for quite some time and to me he has always been kind of the lumbering type…a bit of a goof, you might say. Well, when Wallace and the two gals arrived they were kept separate from the big flock on account of our own ram being in with the ewes and Sally not wanting Penelope and Fiona to be bred. Once we moved out the ram…he’s on another farm at the moment…Wallace and his sisters joined our girls. Wallace became a new man. He still remains interested in his dinner and back scratches but he has also become a bit of a stud muffin. Perhaps it was some lingering scent from our Blue Face Leicesters or the fact that technically it was still well within the breeding season. Now old Wallace spends most of his days prancing (well maybe not actually prancing but definitely more than lumbering) behind all of the girls and showing some definite sexual advances, mostly in the way of fleming (a behavior of rolling back their upper lip and pointing their noses in the air.) It’s quite comical actually and a bit like Mr. Ed the talking horse, for those who remember him. So my guess is that Wallace has no idea that he is not a breeding ram and we are all awaiting the look on his face when the lambs start coming. We are sure that when the first new baby slides into the world, Wallace will have an expression of being both triumphant and a bit puzzled…did I do that? We’ll just let him believe what he wants. 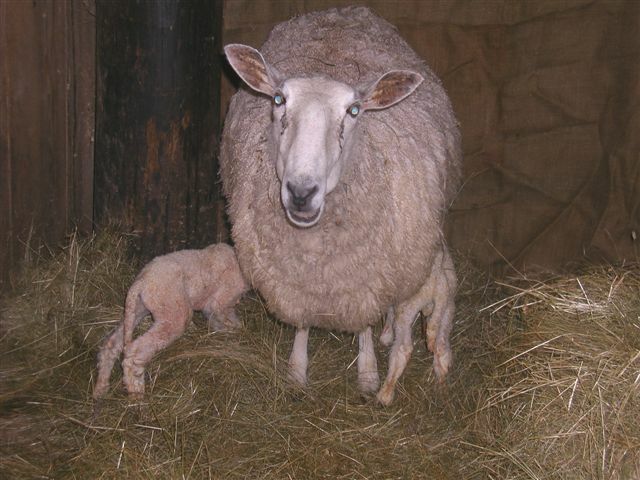 Speaking of lambs, our first ones should be arriving in early March. 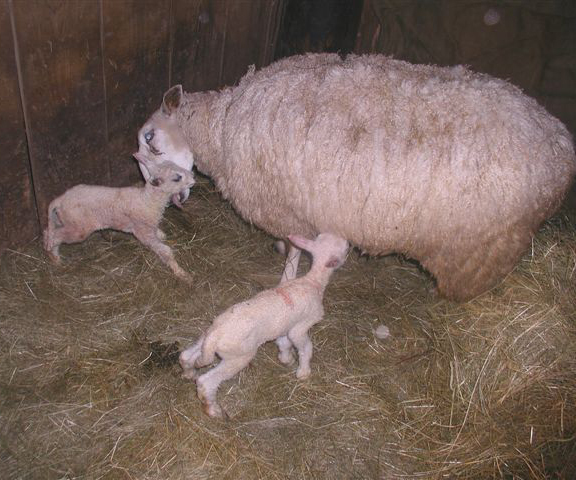 Always exciting, no matter how many times you’ve experienced lambing season. Wallace isn’t the only sheep in the flock that loves attention. The latest storm dumped over 30 inches of snow and it is back to snowing a bit today. 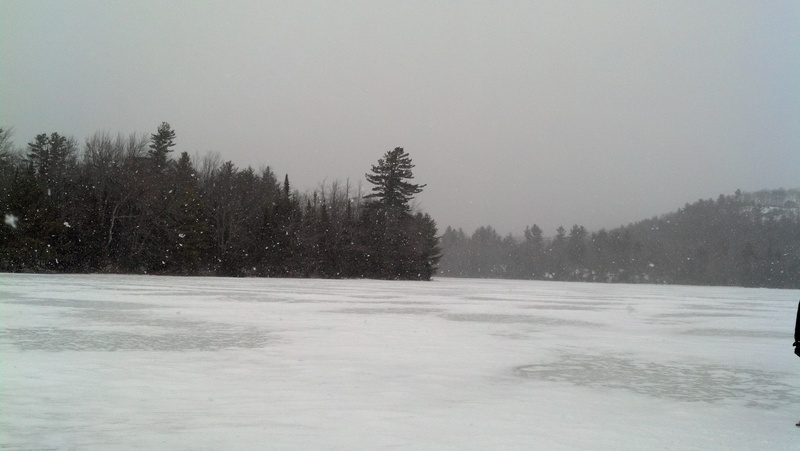 After two days of shoveling and clearing out gates and fences, Rick and I took a long snowshoe down to Kingdom pond. It is so nice to make time to get out and enjoy the incredible beauty that surrounds us. We hope everyone is finding time to bring joy to these winter days. Over the last several months I have had the amazing opportunity to do some traveling. 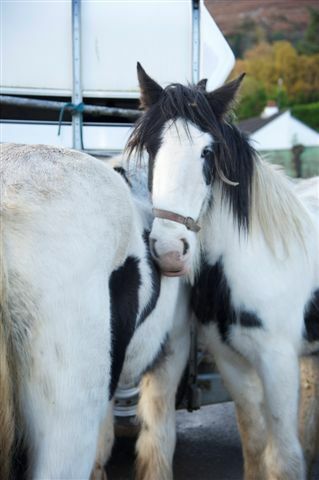 A dear friend of mine, who has been living part time on the south west coast of Ireland, has been increasingly involved with documenting the horse fairs and horseman of County Kerry. She asked me to come along to help with some of the research. 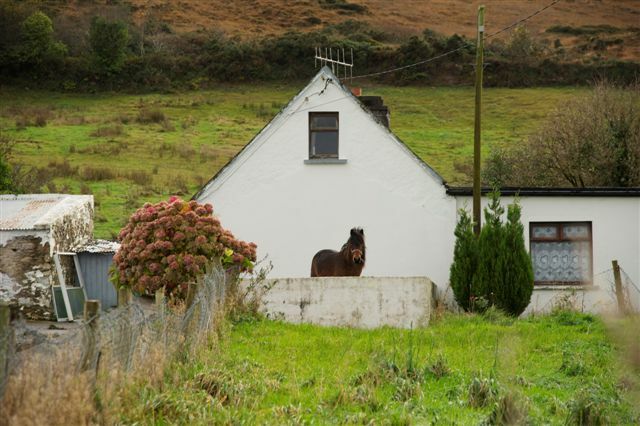 Sally Savage first began photographing the “men and their horses” after stumbling upon a small rural horse fair in the tiny village of Milltown. Her interest in the fairs and with the people who attend them , along with her passion for horses and farming, gave way to a project she was well suited for…a book of her own incredible photographs and words capturing the history and tradition of the horse fairs in rural Ireland, specifically County Kerry. Hopefully, the book will be published later this year. I’ll keep readers posted! UPDATE: The book is published and can be ordered here: www.afairday.com. For me…well, let’s just say, “Ireland is breath taking”. Traveling the country side, attending the horse fairs and meeting the wonderful Irish people who made my visit unforgettable, has become one of the life experiences I will forever cherish. Leaving the farm here in Maine is always difficult but to visit a landscape that is dotted with sheep and cattle, Irish horses and donkeys, is my kind of traveling. My first visit was two summers ago to attend the Puck Fair. Puck is held in the town of Killorglin and is claimed as Ireland’s oldest fair. The fair celebrates the reigning of king Puck, a billy goat who is brought to town during the three day festival. There is great history about how the fair and tradition began and to better understand its origins, I will offer this site: http://www.puckfair.ie/history.php . It is worth checking out and will give a reader a glimpse into what takes place during the three days of Puck. 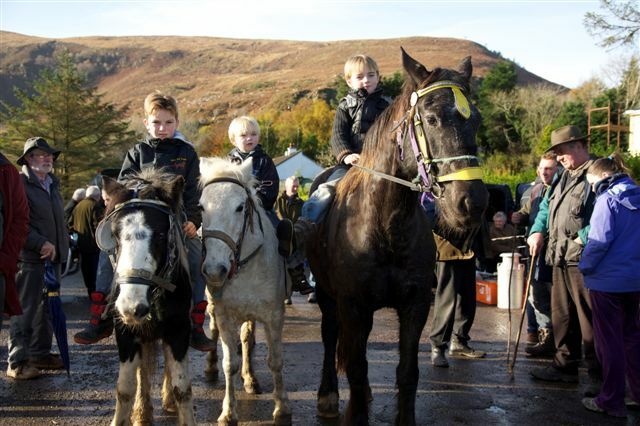 In November, it was the horse fairs at the Gap of Dunloe and Killorglin. The horse fairs in Ireland are unlike any I’ve ever experienced here in the states. They don’t require the organization or formality we often see and expect at our own country fairs. 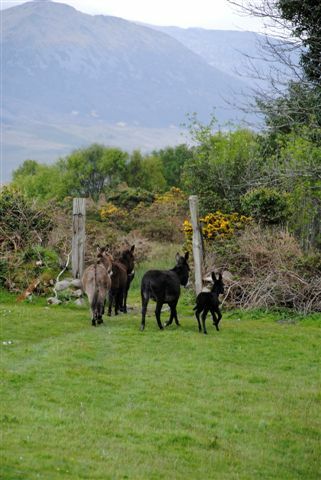 No one is waiting at a gait ushering horseman and their animals to specific sites, all simply arrive with animals in tow, horses, donkeys, chickens, and goats, all of whom mingle freely amongst buyers and sellers. I’ve not seen anyone get stepped on or run over or even tripped by man nor beast, this leading me to believe that the assurance and confidence of the fair goers and horsemen is reflected in the overall scene .It is refreshing to experience the lifelong tradition of buying and selling…and attending…a venue that doesn’t require administrators to get the job done. The fairs have the unique quality of blending excitement and practicality rolled into one. It has been great fun to help Sally with her project, I have been learning a lot about Irish history and culture. It has been interesting to learn a bit about their farming practices, I’m envious of their long season to graze animals and their green, green grass. Of course, coming from a part of our country that is seeing a resurgence in farming, particularly with small diversified farms, I have been curious to see how other parts of the world are growing food. My friend lives on the outskirts of a small village, it is amazing to me that this little town supports 3 butcher shops and a fish market. The bulk of the meats are sourced locally and much of it is grass fed. One of our favorite things to do after a day of interviews and roaming the countryside was to visit one of the butcher shops or fish market and pick out something for our evening meal. Sweet tender rack of lamb, home-made sausages, moist and succulent chicken, freshly caught sole on the bone…you get the picture. Between this and the little bakery down the street which features a display case of locally sourced artisan cheeses, our meals became a 5-star dining experience. I will let readers know as Sally gets closer to having her book on the market and will continue to share some of the adventures we’ve had traveling in Ireland. For now, having returned from my visit to the Emerald Isles, my attention is again focused on the chores and activity of my life here in Maine. 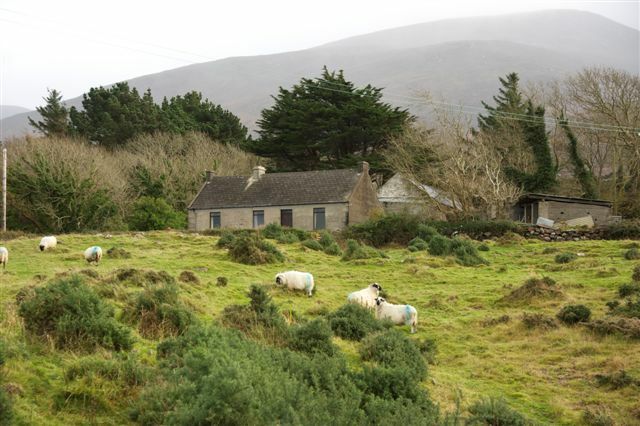 Sheep soon to be lambing, firewood making a steady stream into the house, and seed order forms to fill out…oh, and thoughts of green grass returning to our own part of the world.